Tag: 10 Things I LOVE ♥! | Memorable Days : Beauty Blog - Korean Beauty, European, American Product Reviews. Tag: 10 Things I LOVE ♥! As y'll know I love to do nail art. It's fun to combine nail polishes, create some new designs and it's also fun to share my creations with you girls ^___^. 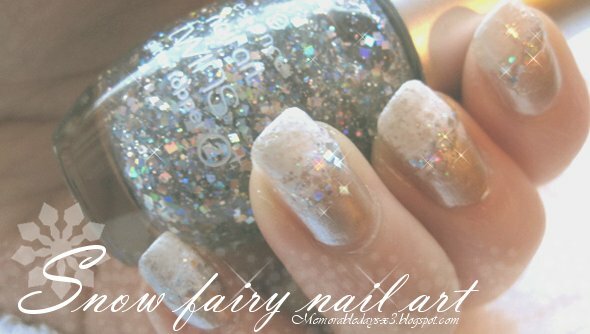 In the picture below you can see one of my creations which I call the Snow Fairy Nail art. Would you like to see more of my creations? Click on Nail art to see more. 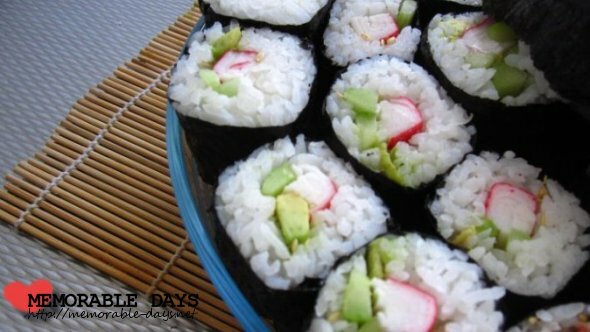 SUSHIIIIII, I can eat it EVERY day!! Maybe, I should just move to Japan hahah ='D. My favorites are salmon nigiri's and maki's! I even work at a Japanese restaurant lol ^o^. In the picture below you can see some homemade sushi's that I made a month ago ^^. I'm still a noob, so please don't judge haha. Can you remember my current favorite accessories blogpost? 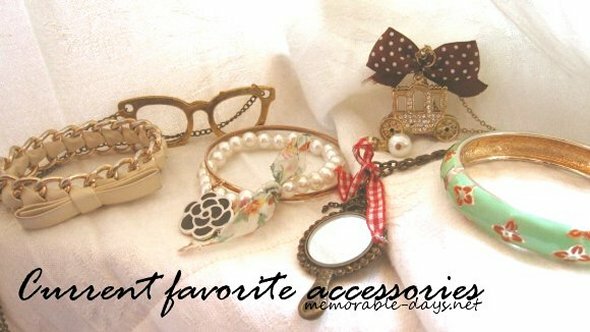 Yes I love accessories and especially accessories with bows and ribbons! I still have a bow-obsession ^o^~ everything which has a bow on it, I will usually buy it because it looks cute =3. Do you have that obsession as well? I love to listen to music! I listen to Korean, Chinese (Cantonese/Mandarin) and English songs. When I go outside I will always carry my Ipod with me. I have this Ipod for a long time now, almost 4 years? and it still looks great ^^ it only has a few scratches. I love the red color and also because it's from the special (PRODUCT) RED edition. 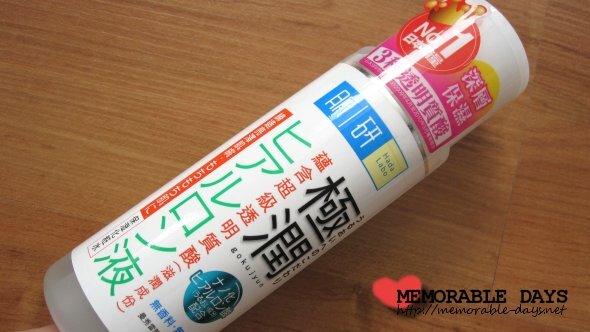 My ultimate favorite beauty gadget, which is called the hair magic sheet. 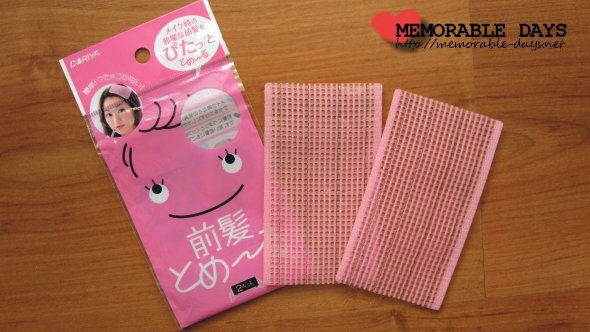 I'm using it every day because it's just easy to work with and my fringe won't get into my eyes anymore because of this ^___^. Green tea is my favorite drink! 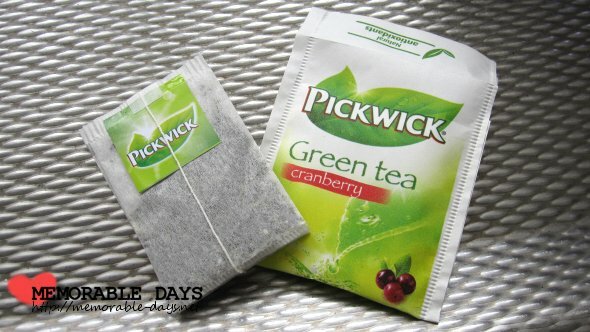 The taste is good, it's good for your health and people say that you're able to lose weight by drinking a lot of green tea haha xD. Can you remember my review about it? Go to my previous blogpost to read the review. I bought a large bottle of this hada labo product a few weeks ago and it has become my NUMBER ONE product at the moment! I highly recommend this to all of you and I will post a part 2 review about it soon ^^. People who have been following my blog for a while know that I have a baby nephew ^^. I posted something about him a few months ago: when he was 3 months. He's 8 months now~ the whole family seems to be happy when he's around ^^. He's so adorable and he makes everybody laugh so easily. All my stress & worries will go away while playing with him. 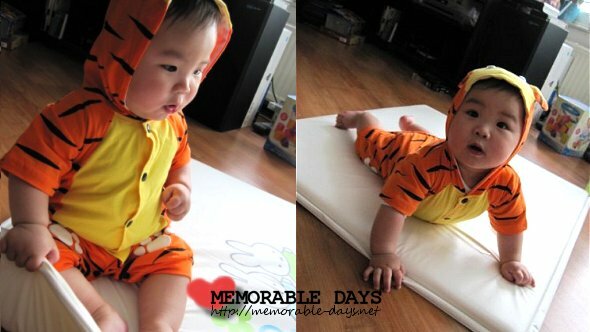 My sis bought a tigger suit for him hahah, so cute right ^o^?! I'm using lip balms every day to keep my lips moisturized. These are products I cannot live without >.<". 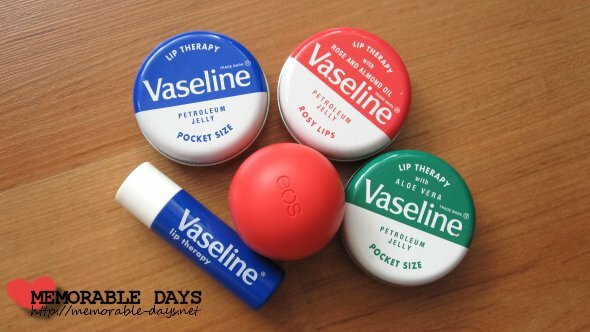 I normally use Vaseline lip balms because they have the most hydrating lip balms I know. I'm only using the EOS lipbalm because of the scent and packaging lol. I did a review about these products before. I'm a big big drama addict. I love to watch series when I'm at home ^^. I'm recently more addicted to Kdramas. The series: playful kiss, secret garden, 49 days and dream high are my favorites and I'm watching City hunter with Lee min ho at the moment ^^. Which one is your favorite? I hope you enjoyed reading my 10 likings. Now it's time to tag 10 other people to do this tag as well. I'm tagging: Suzy, Joey, Vicky, Rinny, Mei, Fiona, Tezza, Emi, Elle, Jennifer. Yay for lipbalm, bb nephew, music en green tea! Your nephew looks totally adorbs in that lil Tigger suit! Thanks for tagging me. I will get down to it soon! I love the lipstick toooo! *_* it's SO nice! The texture is SO SO SO awesome! @Joey, you're watching city hunter because of lee min ho :P ?? hehehe.. i prefer kdramas more than tvb dramas though. @nana, NOOO =( don't kidnap him!! hahah. you really should try sushi at a restaurant :D it's so nice!!! nom nom love sushi and your nephew is too cute!! Nail art (Well, more looking at than doing it myself), Sushi (Could eat that every day! 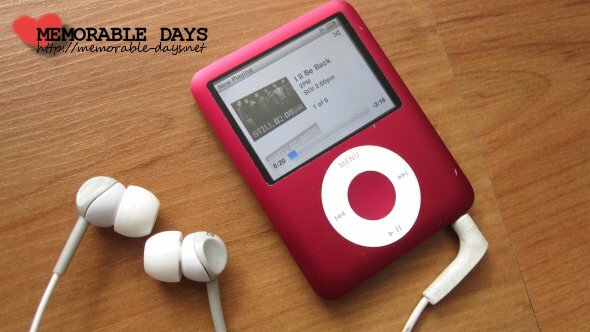 ), Accessories, Ipod - Music (Korean & Chinese, even though I do not understand most of it...), Green tea (LOVE), Korean drama... Aww... I love all that, too! ♥♥♥ And your nephew looks so cute, haha, I would love him, too, if he was my nephew. @my linh, she stopped blogging ;). Haha don't hit me, but I had no idea who Lee Min Ho is before watching. I'm sure all the Kpop/Kdrama fans are gonna hate me, but I just never got into the whole thing. I watched City Hunter because a friend kept forcing me to watch hehe. It's quite nice, am enjoying it so far. I'm going to sound like an oldie, but I very much prefer the older batch of actors in TVB dramas. @Elisa OMG! Really, that is such a pity. I really liked her blog... :,( Glad you are still blogging! @Joey, hahah nooo i won't hit you =3 I won't dare xD. Yeah, i'm enjoying city hunter so far as well :). And about tvb dramas.. noo i prefer the actors from now than the older ones xD, some dramas are really fun to watch like Ghetto Justice which is airing now. Kevin Cheng is HAWT lol! Buahahahaha I class Kevin Cheng in the "older" batch. Not old as in old in age, but the batch where people could actually act. You know, like Ada Choi, Moses Chan, Raymond etc. I see a lot of really new and young faces who have still got a lot of catching up to do. wow ,what a fantastic nail art ,That's really beautiful.